We Did It! And without all of your love and support we really couldn’t have done it without you. 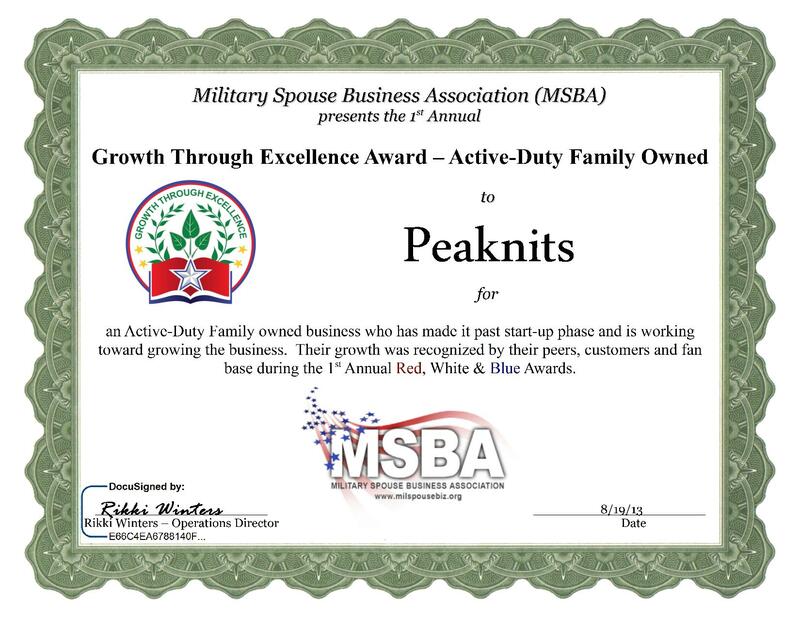 Peaknits is the proud winner of Military Spouse Business Association’s 1st Annual Red, White and Blue Awards. All of the daily voting, reminders, shares, and simply taking the time to acknowledge our little corner of the world added up. THANK YOU! In addition to receiving the award and grant, it also gave us the boost of confidence we needed to venture out more. Now, every Thursday, we can be found at our booth at the Farmer’s Market in Laurel, Maryland. Our first booth was such a great experience, and we received such a warm welcome from everyone – the Board of Trade, other local farmers and vendors, and new customers! I only wish we had done it sooner! We also opened up a store in Savage Mills. Themed around handspinning, knitting and weaving – this is a no pressure sales environment where you can come in, sit, and bring in your most current work in progress. Have questions, or want to learn more? We also offer classes that are geared towards renting or buying gently used equipment to fit the fiber artist on a budget. Come on in, say hello and enter our vendor sponsored giveaway – our grand opening is on October 11th!